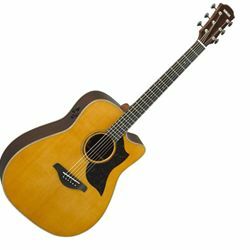 The A5R ARE, traditional western body cutaway guitar, features all-solid rosewood back and sides with hand-selected sitka spruce top with Yamaha's original A.R.E. wood-torrefaction technology. Natural, dynamic plugged-in tone from the SRT2 pickup system perfectly suit your performance on the stage and the made-in-Japan premium build quality will gratify advanced players' desire.